In a saucepan, heat butter, apples, ginger, water, cinnamon, honey and orange juice over medium heat. Simmer over medium to low heat, stirring occasionally, until apples become tender and sauce begins to thicken, about 20 minutes. In the meantime, whisk buckwheat flour, baking powder, baking soda, salt and cinnamon in a mixing bowl. In separate mixing bowl, beat milk, egg, vanilla extract, honey and coconut oil until combined. Pour flour mixture into milk mixture, gently stirring until batter is smooth. Let rest for 5 to 10 minutes, or until bubbles begin to form. Melt butter or coconut oil on griddle or skillet over medium heat. Spoon 1/4 cup of batter onto griddle or skillet, cook until bubbles form and edges dry, about 2 to 3 minutes. Flip and cook for an additional 2 to 3 minutes, or until browned. Repeat with remaining batter. 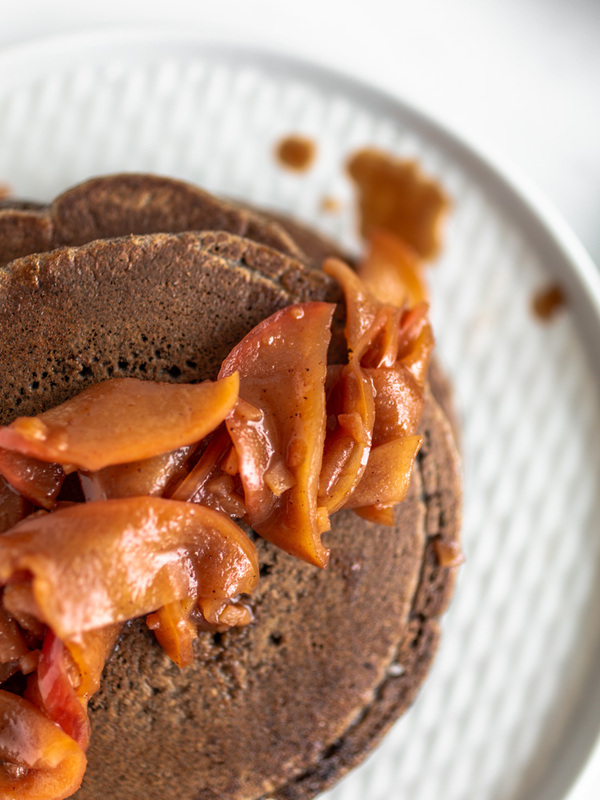 Serve pancakes with a heaping spoonful of warm apple cider compote - and maybe even a dusting of cinnamon if you're feeling extra. Side of coffee highly recommended.